Turkish President Recep Tayyip Erdogan accused Benjamin Netanyahu on Sunday of being “a terrorist” after the Israeli prime minister rejected Ankara’s “moral lessons” over deadly clashes in Gaza. “Hey Netanyahu! You are an occupier. And it is as an occupier that are you are on those lands. At the same time, you are a terrorist,” Erdogan said in a televised speech in Adana, southern Turkey. “What you do to the oppressed Palestinians will be part of history and we will never forget it,” he said, adding: “The Israeli people are uncomfortable with what you’re doing. The comments came after Israeli soldiers killed 16 Palestinians and wounded hundreds more on Friday when a major demonstration led to clashes along the border with the Gaza Strip. Erdogan condemned Israel over its “inhumane attack”, prompting a sharp response from Netanyahu. “The most moral army in the world will not be lectured to on morality from someone who for years has been bombing civilians indiscriminately,” Netanyahu tweeted. Netanyahu has previously labelled Erdogan as someone who “bombs Kurdish villagers”. Israel has defended its soldiers’ actions after they opened fire on Palestinians who strayed from a main protest camp attended by tens of thousands and approached the heavily fortified fence cutting off the Gaza Strip. 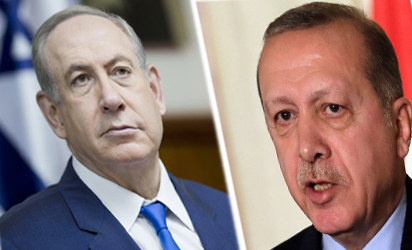 The post Erdogan calls Netanyahu ‘terrorist’ over Gaza deaths appeared first on Vanguard News.